When I first received the Camelot Dragon PRO2 Mk 2, I thought I would be able to evaluate and write about it in a short amount of time with little fiddling around. After all, it's primarily a jitter-reduction device with some nifty features, including resolution enhancement, that simply plugs in between your CD transport and external DACit should have been quick to take measure of. I should have been able to plug it in, burn it in, listen to it for awhile and then hit the keyboard to start writing. However, from an audiophile's point of view, the Dragon PRO2 Mk 2 performs two main functions that affect sound quality in a system, and I never anticipated just how versatile the Dragon is and how many different ways it can be used. First of all, the Dragon has a data re-clocking mechanism that is intended to reduce jitter in the data stream traveling from the transport to the DAC. While many people feel bits are bits, the digital stream is actually a bit more complex than that. Jitter refers to the timing errors of the bits as they travel down the digital highway and eventually arrive at the DAC. Jitter affects the output signal after conversion and, ultimately, what you hear. The optimum is to have no jitter, but in real life, many variables including connections and even wire can induce jitter into the signal. I have heard many CD transports of varying prices and overall quality that attempt to solve the jitter problemwith surprising results. The most expensive transport is NOT always the best. However, the better transports all have similar sonic characteristics. Subjectively, a reduction in jitter manifests itself as seemingly tighter and deeper bass, better clarity, enhanced image focus, improved soundstage depth, and more refined treble performance. The second function of the Dragon is the resolution enhancement performed using digital signal processing (DSP). This is very cool because it attempts to extract more information from what's inherent in the 16-bit CD standard. In short, DSP takes the incoming 16-bit data, adds dither, and outputs either an 18- or 20-bit word length to the DAC. The intent, once again, is to improve sonic performance. The resolution enhancement is fully user selectable and can range from none at all to 18 bits to 20 bits. Whether one selects an 18- or 20-bit word length is determined by knowing what word length the DAC's input receiver can accept. For example, it's probably not a good idea to select 20 bits if the receiver can only accept 18. Experimentation is simple, the flip of a switch, so figuring out what sounds best is easy. While these are the two main functions of the unit, the Dragon Pro2 Mk 2 comes housed in an exceptionally versatile box that includes five digital inputs: I2S, AES/EBU, S/PDIF coaxial, AT&T glass, and TosLink. From the outputs, the digital data exits in I2S, AES/EBU and coax formats. 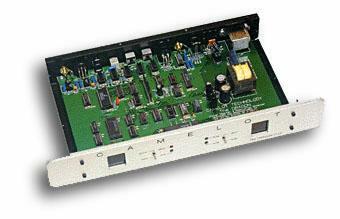 Which output you use depends on what your DAC can acceptsometimes DACs don't have all of the connections, although they usually have a coax input at the least. In general, I2S and AES/EBU are considered superior to coax, although splendid results can still be had with any of the outputs. Finally, a nice touch is the addition of a phase inversion switchthe results, depending on the recording in use, can be quite startling. The Dragon is far more than a jitter box. With all of its connection versatility, it can also function as a digital-connection converter. Do you have only a TosLink output on your transport (generally considered to be the poorest performer of all of the connections)? The Dragon can take that signal and output I2S, AES/EBU or coax with jitter reduction and resolution enhancement happening in between. What goes in is not what comes out in the Dragons case, and that is very attractive for today's increasingly complex systems. The potential uses of the Dragon are far-reaching. Is it fair to readers to simply place the Dragon in the heart of a single high-end system and write about its performance in such a limited way? Heck no. The fact is, such versatility asks countless questions and begs that countless things be tried. For example, one basic question I've wrestled with for years is "Can a high-quality jitter reduction box negate the need for an expensive transport?" For reasons I've never understood, in the last half-dozen or so years since these types of boxes have been introduced, I've never seen a reviewer write in any depth about such a simple test. It seems to me that consumers would be interested in the outcome. I have no fear and luckily I've got the cheapest of transports on hand, a Denon DCS-210 portable CD player that I bought for $200 when it was discontinued. It's a wonderful little unit with, you guessed it, a digital output jackrare among the portable crowd. Prior to the Camelot unit, I tried the little Denon as a transport alone and there was a large enough difference between it and my Theta unit that I deemed it unworthy as a high-end transport. Now let's see what the Dragon in the chain can do. Furthermore, with the proliferation of DVD players on the market, most with at least TosLink outputs and usually with coaxial outputs too, budget-conscious audiophiles can potentially cut their costs and use a DVD player as a source for both movies and high-quality CD playback. Is a Dragon-equipped DVD player just as good as a more expensive transport? Second time lucky! Also on hand in the my household is a Kenwood SV700 DVD player with TosLink and coax outputs capable of providing 16-bit/ 44.1kHz digital audio. You better believe that I'll be trying this as a source too. The Dragon provides jitter reduction, resolution enhancement, and plentiful switching capabilities. Add to these the nice built quality and a simple-to-use packagethe only other thing I could ask for that's not there is a remote control. There is a lot to try with the Camelot Dragon Pro2 Mk 2 and a lot to write about. Tune in over the coming months as I tell you how it all turns out. I can promise that it will be interesting.